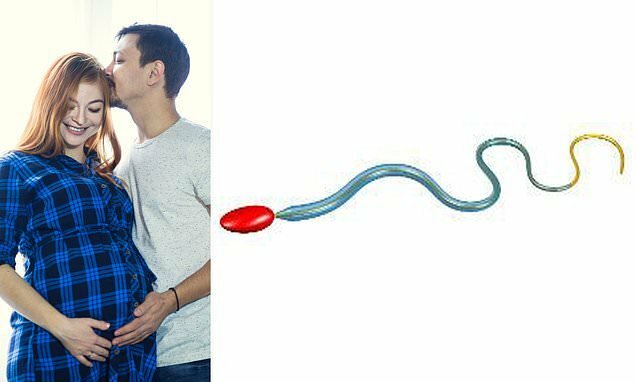 Scientists have discovered that human sperm get the strength to succeed in the race to fertilise the egg from their tails. British-based researchers discovered that healthy sperm have a reinforcing outer-layer which coats their tails. This gives them the strength to make the powerful rhythmic strokes needed to break through the cervical mucus barrier. The findings could lead to better sperm-selection methods in IVF clinics, with the fittest sperm being identified under conditions that mimic nature more closely. Only around 15 out of the 55 million sperm that set out to fertilise the egg are able to make it through the reproductive tract. Cervical mucus is a hundred times thicker than water, making it one of nature’s toughest selective challenges. A total of 3.5 million people in the UK are affected by fertility issues, and couples who opt for IVF spend an average of £20,000. Doctor Hermes Gadêlha, of York University, said: ‘We still don’t fully understand how, but a sperm’s ability to swim could be associated with genetic integrity. ‘Cervical mucus forms part of the process in the female body of ensuring only the best swimmers make it to the egg. ‘During the sperm selection process, IVF clinics don’t use a highly viscous liquid to test for the best sperm as until now it was not clear whether this is important. He said sperm tails – or flagella – are incredibly complex and measure just the breadth of a hair in length. The researchers compared the tails of sperm from humans and other mammals, which fertilise inside the body; with sperm from sea urchins, which fertilise outside the body by releasing their sperm into sea water. While the tails of sea urchin and human sperm share the same bendy inner core, the study suggests that the tails of sperm in mammals may have evolved a ‘reinforcing’ outer layer to give them the exact amount of extra strength and stability required to overcome the thick fluid barrier they come up against. The researchers used virtual models to add and remove the features of flagella in the different species so that they could identify their function. They tested the ability of virtual sea urchin-like sperm to swim through liquid as viscous as cervical mucus. They found that their tails quickly buckled under the pressure, rendering them unable to propel themselves forward. Human sperm, on the other hand, thrashed around wildly in a low-viscosity liquid like water. But they explained that in thicker liquids they began to swim in a powerful rhythmic wave. Sperm are vital in human reproduction and the motility of the male cells is crucial. In order to help the sperm cells move, they evolved a ‘tail’ which is called a flagellum. Sperms’ tails play a critical role in their ability to swim and consequently fertilise an egg. Sperm tails consist of around 1,000 building blocks, including structures known as tubulins, which form long tubes. Attached to these tubes are moving molecules called motorproteins. 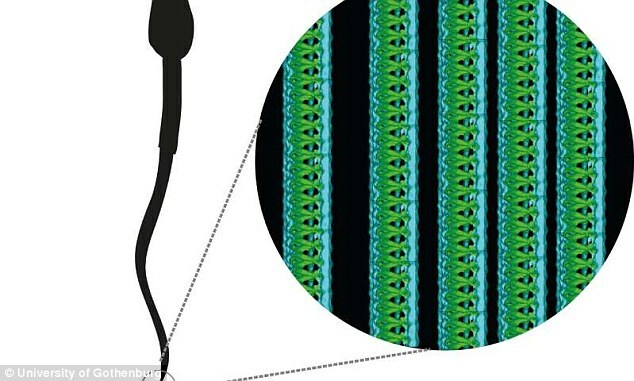 These pull and bend sperm tails, enabling them to swim. The movement of the tail is powered by a mitochondria, the powerhouse of a cell, which produces energy. Doctor Gadêlha said: ‘Using virtual sperm we were able to see how mammalian sperm is specially adapted to swim through thicker fluids. But with no central nervous system to make decisions about how to move and when, the team said that what controls sperms movement remains a scientific mystery. Dr Gadêlha added: ‘We know that, just like in our arms and legs, sperm have tiny muscles which allow their tails to bend- but nobody knows how this is orchestrated inside the tail, at the nanometric scale.